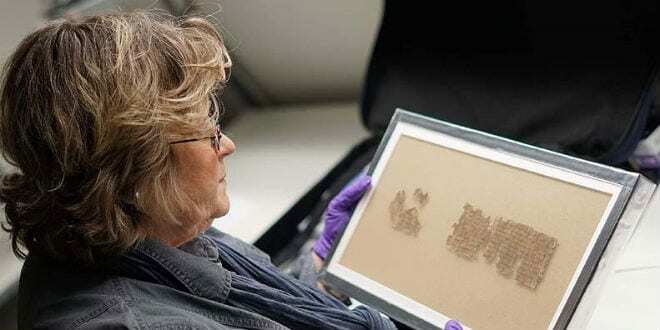 20 Dead Sea Scrolls in Major Israeli Antiquities Exhibition in Denver - Breaking Israel News | Latest News. Biblical Perspective. Fascinating manuscripts from the Dead Sea Scrolls collection will appear in public for the first time as part of the new Israel Antiquities Authority exhibition opening at the Denver Museum of Science and Nature will open at the Denver Museum of Science and Nature on March 16. The large-scale exhibition features some 600 artifacts, including a stone weighing 3 tons from the Western Wall, the largest and most impressive lintel ever discovered in Israel from a First Temple era royal estate, and the stars of the show – 20 Dead Sea Scrolls. A scroll dealing with matters of ritual purity and impurity will be shown, and part of the scroll known as Musar la’Mevin (Instruction to the one who understands), also known as the Sapiential Work Scroll, containing apocalyptic messages. Although the exhibition will remain open for six months, the first 10 scrolls on display—under strictly monitored conditions, will be sent back to Israel in three months, to be replaced by 10 other scrolls. The scrolls returned from the exhibition will be kept for at least five years in the Israel Antiquities Authority climate-controlled vault, in conditions simulating those of the Judaean Desert caves in which they were discovered. The scroll on rules of ritual purity, designated 4Q274 Taharot (Purities) A, was written in Hebrew at the end of the first century BCE and deals with matters of purity and impurity according to the Bible. Because only the ritually pure could deal with sacred matters, those who were ritually impure had to return to a state of purity. Ritual impurity could pass from an individual or object to another. To once again become ritually pure, certain actions had to be taken, such as ritual immersion or isolation. The numerous ritual immersion baths and stone vessels found in archaeological excavations of the Second Temple period in Israel show that the laws of ritual purity were very significant in daily life in Hasmonean times and throughout the Second Temple period. This scroll, shown in public in Denver for the first time, is further evidence of the centrality of this issue in the daily lives of Jews of that era. It states that ritually impure individuals had to be isolated not only from those who were ritually pure, but also from those with a different form of impurity. This attitude also appeared later in the ancient rabbinic literature. Fragments of Scroll 4Q418, Musar la’Mevin (Instruction to the one who understands), also to be shown for the first time in the Denver exhibition, is part of a wisdom composition from the end of the first century BCE. It is similar in character to the biblical book of Proverbs, although it contains apocalyptic messages. Written by a teacher or a sage, it contains instructions to a disciple on the moral conduct that will enable him to avoid evil acts and achieve success in all areas of life, and the high spiritual level attained by the most righteous individuals. The instructions for daily living include advice on fair business practices as well as on marriage. One unusual characteristic of this work is the constant repetition of the Hebrew phrase raz nihyeh, a term whose meaning is still a matter of scholarly debate. Some scholars translate it as “the secret of existence,” but it can also mean “the emerging secret.” The messages in this scroll are presented as information coming directly from God and conveyed through the sages to their disciples. Also among the Dead Sea Scrolls on exhibit in Denver are Biblical, extra-Biblical and sectarian scrolls from the Qumran Caves, reflecting the literary richness of the collection, as well as a document from the Bar-Kokhba Revolt (132–135 CE). The Dead Sea Scrolls are considered the most important archaeological find of the twentieth century, and this year marks the seventieth anniversary of their discovery. They present a unique picture of the spectrum of religious beliefs in Judea in ancient times as well as daily life in the stormy Second Temple period. 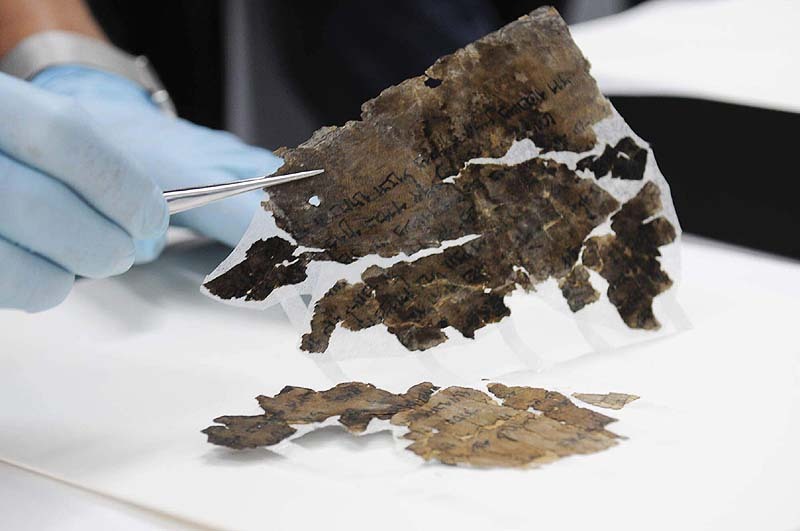 These delicate fragments of parchment and papyrus, including the most ancient copies of the Bible, were preserved for 2,000 years in the dark, dry conditions of the caves in which they were hidden, and now they continue to be preserved in conditions that simulate the caves, in the Israel Antiquities Authority scrolls storeroom. The scrolls can be viewed online in the Leon Levy Dead Sea Scrolls Digital Library, which contains photographs and information on about 1,000 ancient manuscripts.